The United Kingdom has lifted a travel advisory covering the southern tip of Cebu Island, following lobbying from regional authorities. 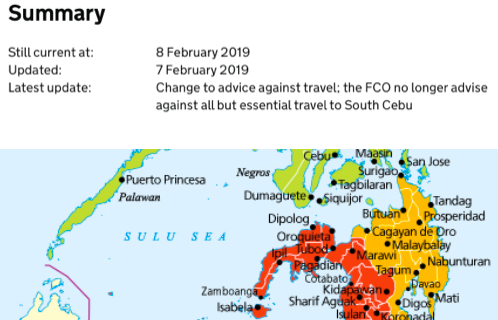 In its updated advisory posted yesterday (Thursday, February 7), the Foreign and Commonwealth website said it “is no longer advised against all but essential travel to South Cebu”. The latest update continues to advise against “all travel to western and central Mindanao and Sulu archipelago because of terrorist activity and clashes between the military and insurgent groups”. It also warns against “all but essential travel to the remainder of Mindanao”. The advisory specifically excludes Camiguin, Dinagat and Siargao Islands. Secretary Michael Lloyd Dino of the Office of the Presidential Assistant for the Visayas said he was “grateful to the UK government for their positive actions on his request to lift the travel ban over south Cebu”. Dino said he agreed with Foreign Affairs Secretary Teodoro Locsin in a cabinet meeting on Wednesday (February 6) to write to the UK government, asking it to alter the advice. “UK is very fast in responding to our request. The lifting means a lot to us, because it would mean more tourist arrivals,” he said. Oslob Mayor Jose Tumulak thanked Dino for bringing law enforcement and regional government agencies to his town last Sunday (February 3) for an inter-agency safety and security summit, which helped to encourage the lifting of the travel advisory. The advice to avoid the south of Cebu was first added to the UK government website in July 2017. This went unremarked by local officials until January of this year, when the advice was updated in the light of the New Year’s Eve blast in Cotabato City. Although this update had no bearing on the south of Cebu, it was apparently enough to draw the belated attention of officials to the warning.